Smoke Screen is a new concept in smoke magic - a tiny and silent device that reliably produces clouds of smoke whenever you need them. Just finger-palm Smoke Screen (it's roughly the size of 4 half dollars) and gently squeeze - clouds of smoke will rise effortlessly from your fingers. There are no clothing restrictions and no get-ready's - it's grab and go. Perform Smoke Screen in short sleeves at a moment's notice. It gives you the freedom to add smoke to any existing effect you already do - coin bends, color changes, transpositions. It gives you the power to perform new effects that are only possible with the freedom afforded by Smoke Screen's unique design. There are no hoses, remotes, or cartridges. The bottle of Smoke Juice that comes with your Smoke Screen will give you over a year of consistent use. And the installed heater wire + silica wick will last a very long time - a back-up is also included with each unit. A one-time charge will easily see you through a 3-hour strolling gig - but the handy on/off switch allows you to store charge in the device for weeks until you're ready to use it. Smoke Screen comes with a dazzling array of heart-stopping routines from Rodney Reyes, Scott Steelfyre, and Chuck Crespo. 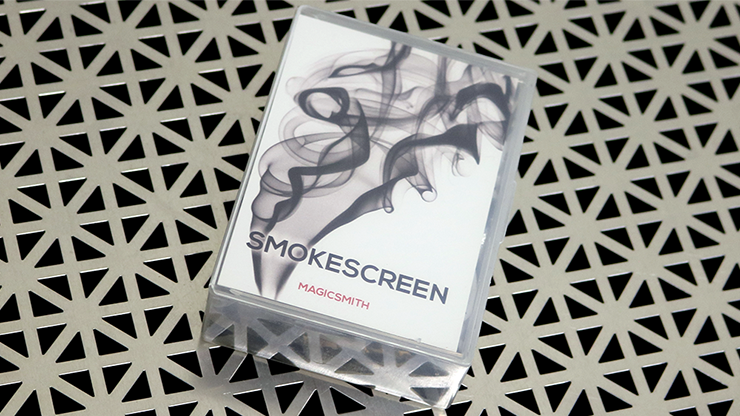 You can now easily add the mystery of smoke into any magic routine - with none of the hassles. Enjoy the magic - and freedom!